Protected area "Mouth of the River Veleka" declared by Order 608/01.09.1992 on the ISAs. Located in the land of Ahtopol, Sinemorets and Brodilovo and covers an area of 1511.2 ha. Project "SINEMOREC - NEW OPPORTUNITIES FOR ECO-TOURISM " aims to found a Eco path in Protected Area " Estuary Veleka" and to promotion it as a tourism product. Eco path starting place is "Tserat" - 1 km. before the mouth of Veleka on the main road connecting Ahtopol and Sinemorec. 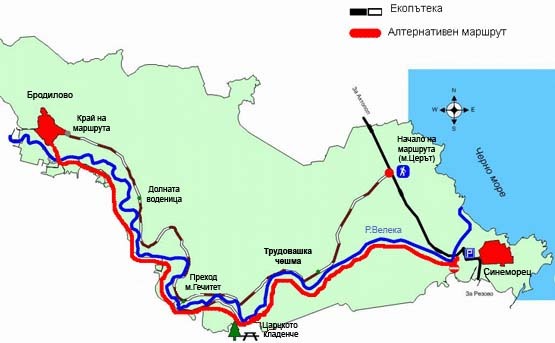 Moving against the flow of Veleka River it passes through the places "Labor fountain" , "Gechitet ", " The royal spring" , "Lower Mill" and reaches it`s final destination - Brodilovo village. Length of route - 10 km. Duration - 3 hours. The route is divided into four parts - 2.5 km each. PART ONE - beginning of route - place "Tserat" - palce "Labor fountain" - 2.5 km. PART TWO - place "Labor fountain" - place "Gechitet" - 2.5 km. PART THREE - place "Gechitet" - "Lower Mill" - 2.5 km. PART FOUR - "Lower Mill - Brodilovo - 2.5 km. End of the route. The project aims to show the typical landscape in the coastal zone, specific Xerothermic vegetation and Pontic-evksinska evergreen shrubs and a rich fauna of the area. Passing the route you have the opportunity to learn about plants and animals of Strandzha, to enjoy the beautiful natural scenery of Veleka River and surrounding areas. At the end of the route you will arrive in the village of Brodilovo - typical for Strandzha disctrict. Local people have preserved traditions and customs of Strandzha in their authenticity and originality. The route is suitable for cycling and horse riding! You can visit City Hall Sinemorets where there is a separate data area for eco-trail, amenities and monitoring it, and get promotional materials. An alternative route (marked in red) goes on the right bank (upstream) of Veleka. Follow the dirt cart path, and stick to the river every crossroads. The road will lead you to place "The royal spring" and then goes to Brodilovo. It should be aware that the river can be crossed only in the place "Gechitet" , which is not well marked and can be omitted. The next bridge is before Brodilovo village . Be prepared for countless insects in the woods, which are all nuisance depending on the season.